Click the publication logos below to link directly to articles. 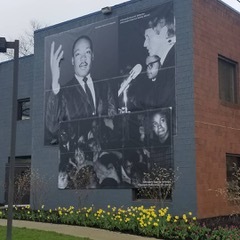 The Kennedy King memorial is located within Dr. Martin Luther King, Jr. Park at 1701 Broadway Street, Indianapolis, IN 46202. The park is open to the public from dawn to dusk. The Kennedy King Memorial offers complimentary admission. Please contact our Public Relations team at least 48 hours prior to your visit to arrange attendance or a tour. If your visit is specifically to fact-gather for a story, please state so in your email and your request will be expedited. Please visit Indy Parks for details about their photo policy. Unless otherwise stated, all photos are © Kennedy King Memorial Initiative. Photos are explicitly for editorial purposes only. Click thumbnail images to enlarge and download. To film on-site, please contact our Public Relations team (allow 24 hours for a response.) Hi-res images of Sen. Robert Kennedy and Dr. Martin Luther King Jr. in Indiana are available through the Indiana Historical Society. For images and required courtesy information, please contact Rachel Hill Ponko, IHS director of public relations, at (317) 233-8814 or rhillponko@indianahistory.org. Visit our Flickr page for more photos.